So, here it is my countdown (57 days) to the big 40th Birthday! Needless, to say I am far from enthusiastic for this to be happening so soon. I know, how did almost 40 years of my life catch up to me. I remember as a teen-ager I hated always looking like I was never my age, the young face, I could never use a fake ID when I was 16 years old because I definately never even passed for 18 years old. But, my mother always told me I would appreciate it when I was older. Funny thing, she was right, I have always been told I never look like im hitting the “oh lordy, she’s 40″ look. Or I never get carded for alcohol or at a bar, until this last weekend in the French Quarter, went to eat dinner and was asked for my ID, I was extremly happy to present it to the server, until she said”thank you mam, we card everyone!” I am not a 40-year-old, nor do I look like it ( I want to thank those who have contributed to my youthfulness: caffeine, smoking and cocktails ) but I am starting to feel it. I have started to do my daily exercise, walking/some jogging for 45 min, i have given up the Coke, the smokes ( maybe 1 with a cocktail ) and the Starbucks( i am sorry, please remember me White chocolate Mocha hot/iced ). I figured I am not a gym person by any means, but will focus on a daily improvement with myself. How did I let it come to this, my body deserves better, even though it did love the extras I gave up. Whoever said “Treat your body like a Temple“, REALLY! 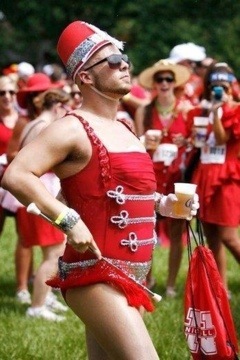 Obviously, they are not from the Big Easy, because it’s not easy! I will set up a daily goal, do my daily walk-outs, and countdown to a new me! Trust me, I love myself, I am confident, and know I have some great features but just need to eliminate the 35 plus pounds of fat from my body. I did look it up and 35 lbs. is equivalent to 280, yes 280 – 20 oz. bottles of Coke! I will now trade my caffeine fix for water, I am not a fan of this water, which is colorless, odorless, tasteless..wait a minute I’m thinking of Vodka. But it is tasteless, no amount of lemon/lime/flavoring will help me want to drink 80 oz. of water a day. I will try because when I hit me 40th I do want it to be about me, why not, it is a milestone in this girls crazy life. So, with that said, my morning Starbucks fix was traded for a generic brand of coffee, fat-free creamer ( so it was flavored: caramel ), and 16.7oz water. So mark the calendars, to join me on this no fun without caffeine, gorgeous fatty foods, and body aches to a better -35lbs ME! Can I make it, in the next 57 days, without all the yummy treats to a skinnier me, we will see!